The theme for our February story slam was BAD DATES. We heard stories of bad matches, bad behavior, and meeting the parents (sometimes way too soon), and Mina Edmondson won with her story about the life lesson she took away from several dates with a man she met on Match.com. Mina is pictured here with this month's host, Matt McDunnell. Mina won an exclusive York Story Slam journal from our friends at Story Supply Co. and earned a spot in our Grand Slam in November. Tickets for our March story slam are on sale now and going fast. The theme is SILVER LININGS. Our last few events have sold out in advance, so we recommend getting your tickets now! We had a great evening at our Grand Slam in November, and now we're excited to kick off our fourth season of live storytelling. We've gotten the green light from Holy Hound Taproom to take over their back room again on the third Tuesday of the month in 2019 and we've selected our themes for the year. Our first Story Slam of the year is scheduled for Tuesday, January 15, and the theme is RESOLUTIONS. We want to hear your stories of New Year’s promises to yourself, goals, decisions, solutions, and determination. However you interpret this month's theme, we look forward to hearing your true stories. We are also pleased to announce that tickets for our January event will be FREE once again this year, thanks to the Cultural Alliance of York County. The Cultural Alliance will host their second annual “CelebrateARTS” week of free cultural events January 13-19 to show the importance and impact that high quality arts experiences have on the health and vibrancy of our community. 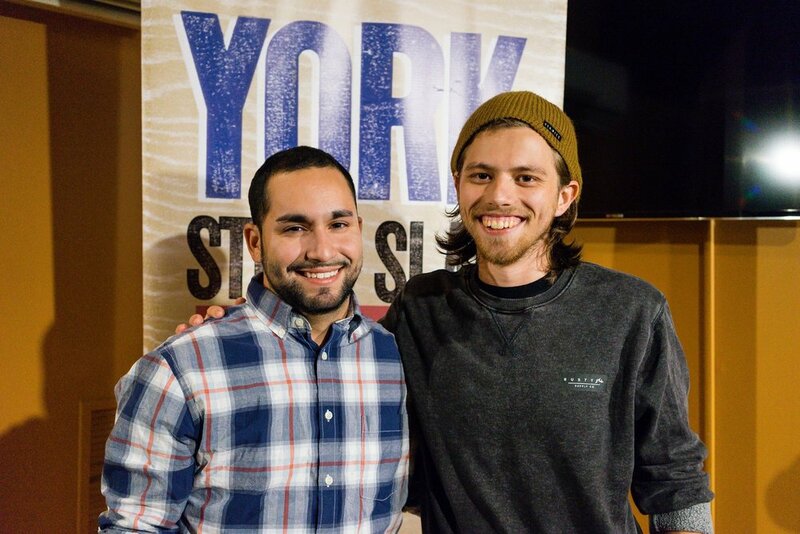 As part of this weeklong celebration, the Cultural Alliance will foot the bill for tickets to the January 15 York Story Slam. You still have to reserve your tickets, but they are FREE. We often sell out when tickets are NOT free, so we expect them to go fast. Get yours now before they're gone. This month's theme was #adulting. We heard stories about having to act like a grownup for the first time, figuring out a career path, and learning to shop like an adult. In the end we had a tie - Susan Crawford, with her story about how her perspective on her father shifted, and Ted Elicker, who talked about what it means to be the adult in a relationship. Susan and Ted are pictured here with this month's host, Matt McDunnell. 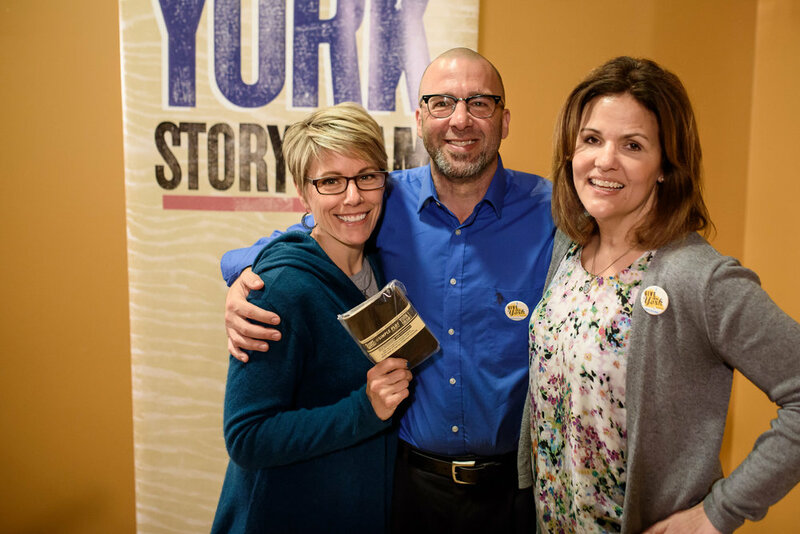 They each won an exclusive York Story Slam journal from our friends at Story Supply Co. and earned a spot in our Grand Slam in November. Tickets for our October story slam are on sale now. The theme is SCARS, and it will be our last regular-season event of 2018. We’ll announce the theme for our Grand Slam that evening. Our events often sell out in advance, so get your tickets now! Our theme this month was Busted. We heard stories about being found out, things getting broken, and even two stories about getting caught urinating in public by the police. Sarah Doherty won with her story about her brother getting away with things throughout high school. Sarah is pictured here with this month's host, Sarah Chain. 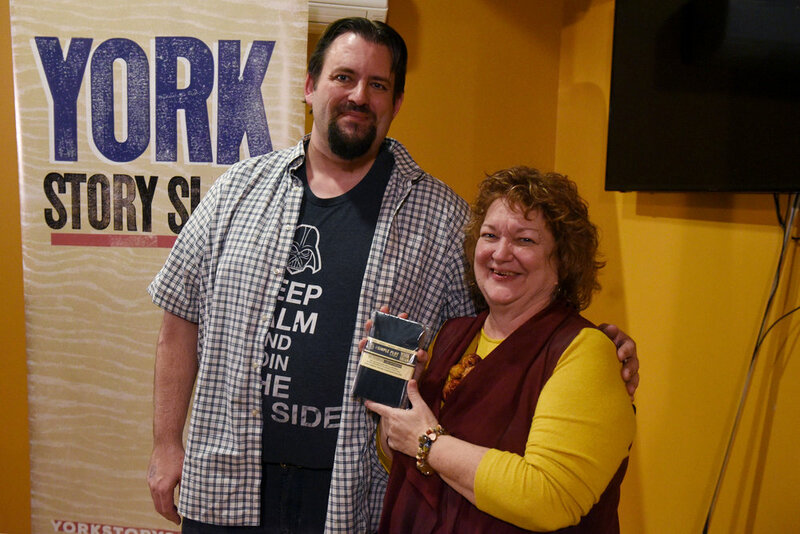 She won an exclusive York Story Slam journal from our friends at Story Supply Co. and earned a spot in our Grand Slam in November. Tickets for our July story slam are on sale now. Our events often sell out in advance, so get your tickets now! The theme is Hot Mess, and Jason Plotkin will be our host for the evening. Our theme this month was Hometown Heroes. We heard stories about family, neighbors, and other everyday heroes who had an impact on the storytellers' lives. Jason Plotkin won with his story about lessons learned from people he encountered as a photojournalist, and the heroism of supporting people who face challenges. Jason is pictured here with this month's host, Luanne Sims (right), and his wife, Melissa (left), who is featured in his story. 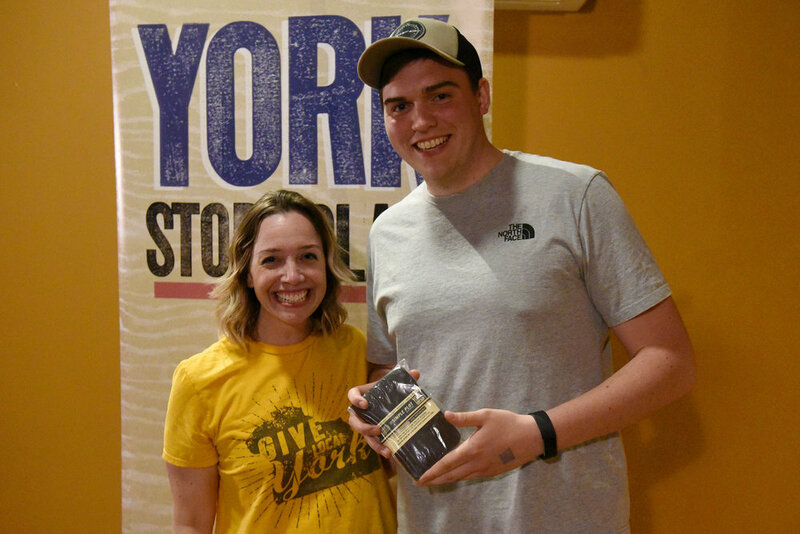 Jason won an exclusive York Story Slam journal from our friends at Story Supply Co. and earned a spot in our Grand Slam in November. Tickets for our May story slam are on sale now. Our events usually sell out in advance, so get your tickets now! The theme is Planes, Trains, and Automobiles. Sorry to say that our March story slam has been canceled due to inclement weather. It will not be rescheduled. If you purchased tickets, we have sent you an email (via Brown Paper Tickets) with your options. Hope everyone stays warm and safe, and that we see you at our April event. Since York will be gearing up for Give Local York, the first-ever community-wide, 24-hour philanthropic giving event, our theme is HOMETOWN HEROES. 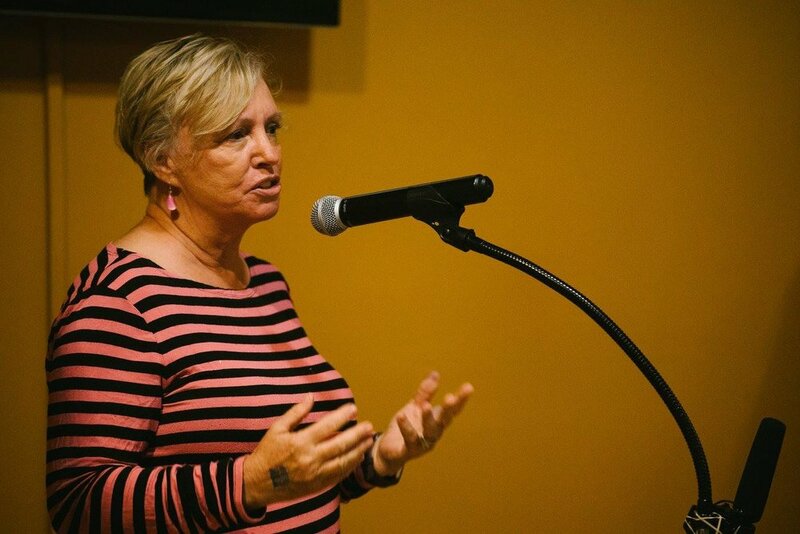 Our host will be Pennsylvania story slam superstar Luanne Sims. Congratulations to Eileen Joyce, who won our 2017 Grand Slam. 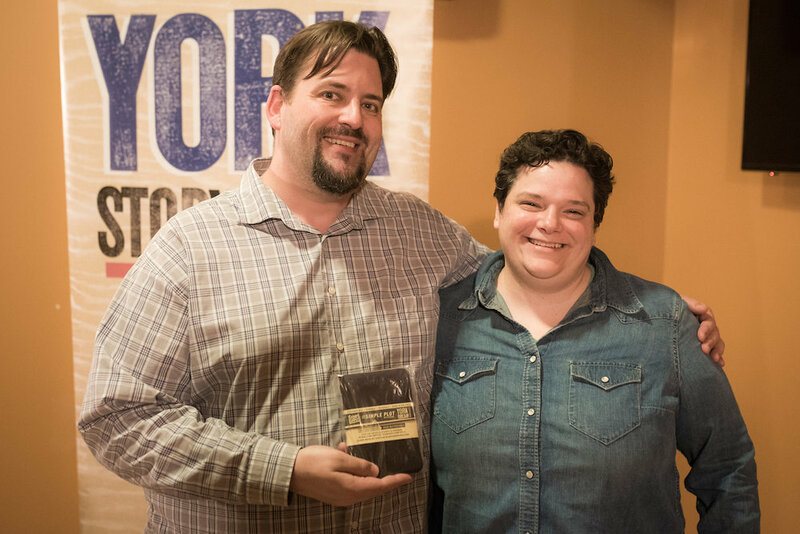 Eileen competed with all the other winners from this year's monthly open mic story slams and earned the title of Best Storyteller in York. The theme for the evening was GLORY DAYS, and more than 200 people were in the audience. We appreciate the support this year from our friends Our York Media, who underwrote some of our expenses so that we could keep our ticket prices low. We are also grateful to work with an excellent team of vendors to produce our events and archive the stories: our photographer Isaac Edmondson Photography, sound guy/audio engineer extraordinaire Logan Summey of Third Leg Audio, videographer Randy Flaum, and Carla at Wilson Media Services, who produces our monthly podcast (click on PODCAST at the top of the page!). We also thank Holy Hound Taproom for giving us a home throughout the year and Appell Center for the Performing Arts for allowing us to host our Grand Slam in such a beautiful space. 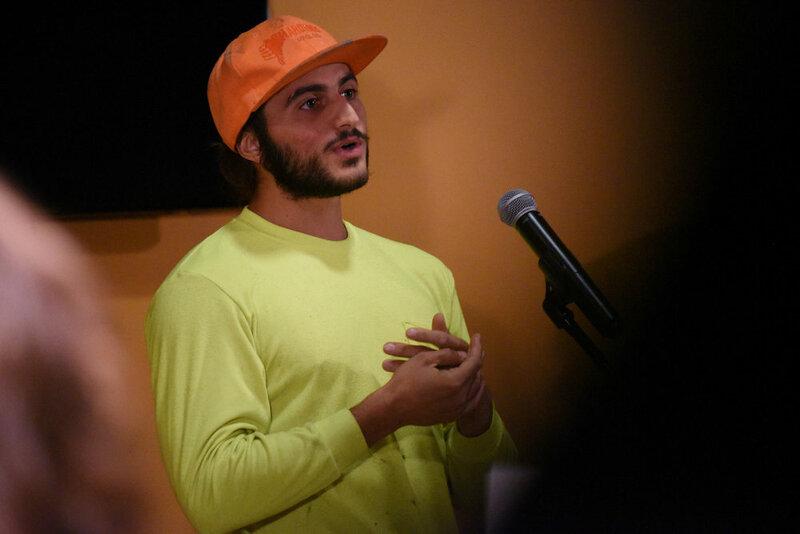 We won’t have a story slam event in December – we'll be busy planning for next year. We'll continue to host our monthly events on the third Tuesday of the month in 2018. Please block it out on your calendar and make sure you’re on our email list (click on the Contact tab above to subscribe) and following us on social media so we can keep you in the loop when we announce the themes for next year. Our theme this month was Child's Play. We heard 15 stories - stories from childhood, stories about caring for children, lessons learned from children, and stories about things that should have been easy - child's play - and were not. Phil Broder won with his story about his mother's recent passing, and the memories and feelings her death has brought to mind. Phil is pictured here with this month's host, Frank Melvin. 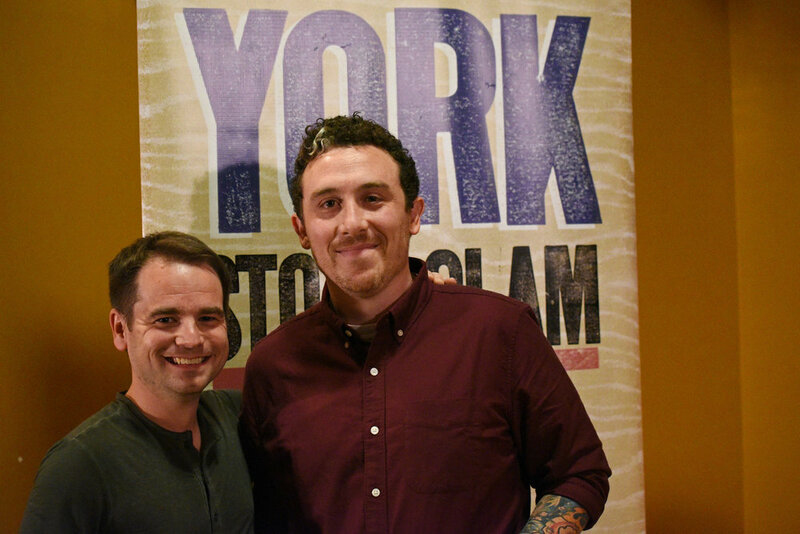 Phil won an exclusive York Story Slam journal from our friends at Story Supply Co. and earned a spot in our Grand Slam in November. Tickets for our October story slam are on sale now. Our events usually sell out in advance, so get your tickets now! The theme is Fright Night. This will be the last regular-season story slam of the year, and we'll announce the theme for our Grand Slam at the end of the evening.